The RD code came about because the garage was called Romford when it was built in 1924. It was renamed Hornchurch in 1935, but retained the code. It was located on the south side of Hornchurch Road (near the junction with the present day St Leonards Way) but closed in September 1988. The RD code was later reused for the present Romford garage (Harold Wood). Four RLHs were allocated to Hornchurch garage in February 1955 (RLH 21, RLH 22, RLH 23 and RLH 76). The allocation was increased to five in early 1957, at which level it remained until the end in 1970 (a graph of the allocation can be viewed here). Over this time, the majority of the red RLHs (24 in total) were allocated to Hornchurch at one time or other. The RLHs were principally used on lowbridge route 248. One was also often used on a series of short highbridge routes in peak times as the years progressed; starting with route 249, briefly route 252, then over 10 years on route 248A. The last day for the RLHs with LT here was 18/9/1970. Afterwards RLHs 52, 68, 71 & 73 were transferred to Poplar Garage for storage, and RLH 69 was transferred to Dalston Garage. Some other RLHs also continued to be seen around Upminster into the 1970s, being used by private operators Super Coaches, City Coach Lines and Blue Line Coaches. 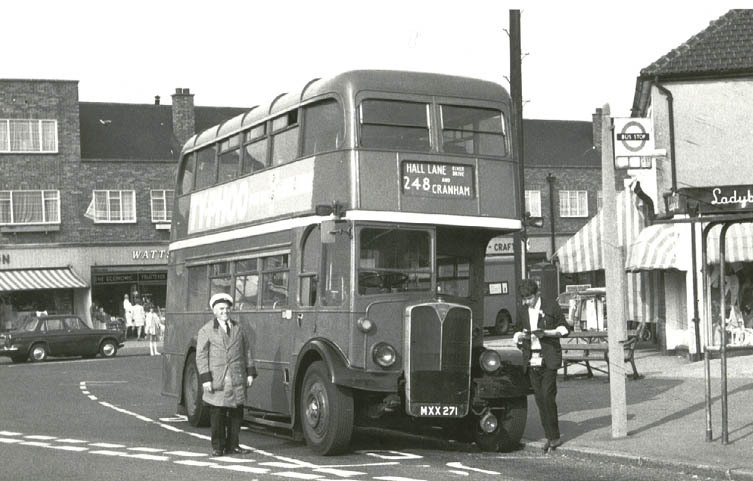 The RLHs replaced Leyland Tiger single decker TD buses which had been on the service since early 1949. The core 248 ran from Cranham to Upminster Station (1.25 Miles). Four buses were allocated on Weekdays (running numbers RD 100 - 103, albeit RD 103 ran in Rush Hours Only). Two vehicles were allocated on Saturday. Front Lane (above) was a full turning circle/u-turn at a busy T-junction which took some skill to drive around in one go. Steve Dean remembers; " I always preferred to terminate at Front Lane as the railway yard security office was opposite the stand. In the morning just before the rush we used to have toast and a brew with the railway man, who used to supply many of the bus crews from his little billy can ... (made of white enamelled metal and the top formed a cup). All underground crews on the District line had them as there were no facilities on their route. You will notice the young conductor wearing his Gibson ticket machine like we all did. We were always being booked for this by the 'jobsworth inspectors' if they couldn't find anything else wrong with the bus. Another reason to book us was not wearing your PSV badge on your lapel, many had it back to front so if you was cheeky to any of the passengers they struggled to report you. " The low bridge on St.Mary's Lane, Cranham (above) is still known as Wantz Bridge. Generally 'Four Wantz' = Four Ways, and the bridge is on what amounts to a cross roads - a T-junction with fourth prong a little offset the other side of the bridge. The Roads involved were there a long way back in history (Upminster was still little more than a village until between the wars) and one presumes that name stuck. 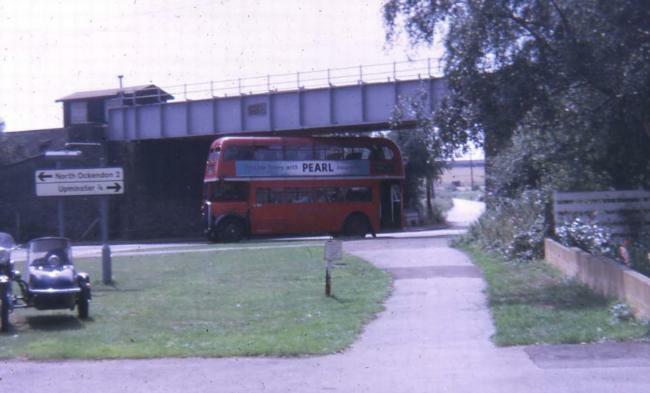 RLH 68 passing Upminster Station in 1969 or 1970. Some journeys were extended a further 0.95 miles from Upminster Station (above) to 'Hall Lane/ River Drive'. This section was also covered by routes 86 and 193 - at times (eg Saturday after 18.00) it was not covered by the 248; during weekdays three of the six buses an hour ran the full route. At Hall Lane the route turned right into Avon Road, buses then reversed into Severn Drive, and stood time at the stop at the top of Avon Road. The Sunday service was withdrawn from 15/11/64. 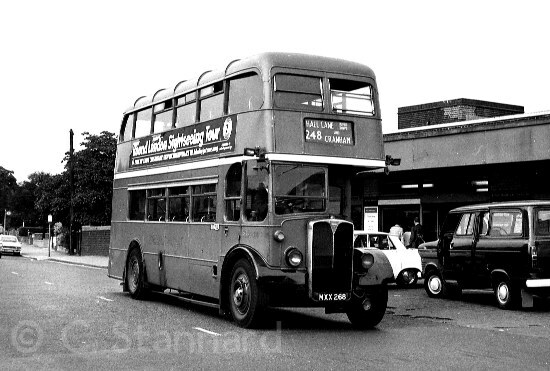 The RLHs were replaced by SMS type single deck one-man-operated buses in 1970. The route was extended to Romford. 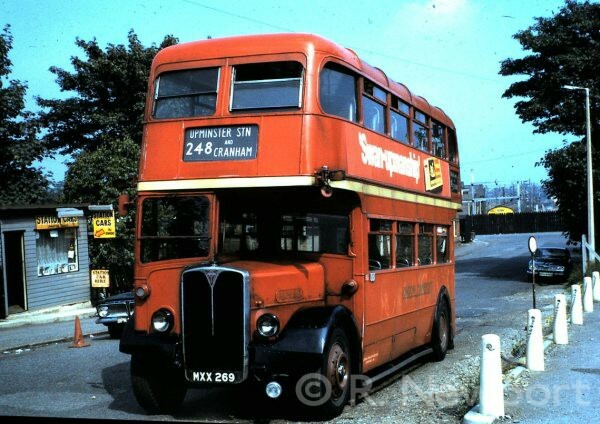 In later years, it was withdrawn between Cranham and Upminster so that normal height double deckers could be used on it. At the time of writing in 2006, route 248 again goes from Upminster to Cranham, except it avoids the low bridge by taking a northerly routing via Avon Road instead of St. Mary's Lane. The 248A was a Mon- Fri Rush Hours only single bus operation (running number RD 110) and more often that not covered by an RT. It did a straight run down Station Road into Corbets Tey Road, turning on a dedicated patch of tarmac at Corbets Tey - a stand at one time shared with the 722. The last bus left Corbets Tey about 1915 and went directly to the garage. The crew then took their meal relief and completed their second half on route 248. The route was the shortest bus route in London, with a 6 minute journey time!